I can create one of these amazing logo reveal intro/outro animations for your business or whatever project you might have! This animation will look amazing at the beginning or end of your videos or presentations and will make you stand out to your competition! You can use it in all social networks and channels and for all types of business or non-business purposes. ✔ One of pph.com TOP LEVEL sellers with 100% positive reviews and only happy clients! ✔ You can choose 1 of those 10 animations and I will create it with your logo, website, text or whatever graphic you may need. 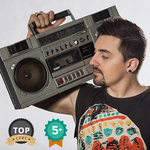 ✔ YOU GET FREE MUSIC OR SOUND DESIGN ON YOUR ANIMATION! ✔ I will deliver the final output file HD READY (1280 x 720px) resolution. If you want it in FULL HD RESOLUTION you will have to purchase the add-on option for it! You get whatever video format suits you! Just say the word! IMPORTANT: This hourlie offer does not include custom work like animating your graphic. It's just for preparing 1 of the 10 sample videos with your text and/or logo. More services available as add-ons. Contact me for more information. 1. Choose your desired logo reveal animation from the sample clips provided in this hourlie offer. 1-10 from left to right. 2. Send me your logo, website, slogan or whatever graphic you might want in high resolution transparent background file format. Perfect intro and fast too. Thank you. Work was delivered in less than an hour and was just how I expected it to be. Perfect Freelancer. Couldn't have asked for better than this. Will be back to use Georgi for other jobs. Amazing! Superb as always. Very responsive and excellent work. Made small changes where required. Highly recommended! Fantastic work - 5 stars highly recommended. Excellent as always! Im very satisfied with the communication and impressed by the speed! Welcome to my PPH Profile! My name is Georgi and I am a professional video, animation and graphics producer and editor from Sofia, Bulgaria. Not sure about how to create the idea...Read moreWelcome to my PPH Profile! My name is Georgi and I am a professional video, animation and graphics producer and editor from Sofia, Bulgaria. Not sure about how to create the idea that you have on your mind? Don’t worry! I am here for you! I can produce and edit your video, animation or graphics design projects. I have over 10 years of experience in Multimedia production and design and I am full of creative ideas! Every project is unique and individual for me and deserves maximum attention. So don't hesitate to get in touch guys. I can bring your projects to life today! For a full list of services and a breakdown of pricing, please don’t hesitate to send me a message across via PPH.com!